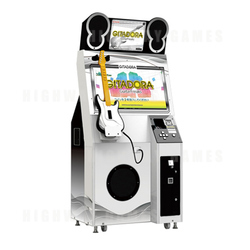 GuitarFreaks GITADORA Overdrive arcade machine is a music/guitar simulation and is the 2013 installment of the GuitarFreaks series. This one player game comes as a compact cabinet, with an all new white design and a single guitar control. It features a large HD LCD display (16:9 wide screen), PV game system, a six button control configuration, all new songs and re-evaluated difficulty levels - now named Basic, Advanced and Extreme. This installment maintains the skill system from XG3, but the game play has been simplified in selecting, gaming and results display to help new players. The game screen is in traditional PV system which is similar to XG1 and the track can be made half transparent or full transparent for more challenge. To play the game, players simply hold down the neck buttons and pick the lever in time on the simulation guitar in accordance with the 'notes' that appear on screen. This includes 'OPEN' in which no buttons should be held down and the Wailing Bonus, in which players move their guitar neck up or down according to the indicative arrows - a bonus will be added for success or combos!